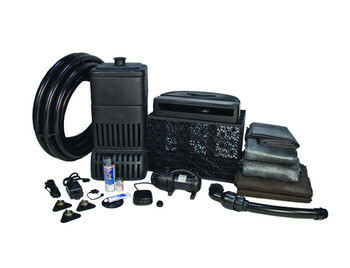 Pondless Products Large Pondless® Waterfall The all-inclusive kit creates a pondless waterfall with up to a 26 ft. stream using an AquaSurge Pro 4000-8000. The kit includes: 12′ x 15′ linear underlayment 9180 sq. ft.), 10′ x 30′ stream linear Pondless waterfall vault, Pondless waterfall extension, waterfaull spillway, large AquaBlox, AquaSurge Pro 4000-8000 pump, 2" x 50′ Flexible PVS pipe pump check valve assembly and installation kit, get your feet wet door hangers, 1-watt 12V LED waterfall lights, 60-watt transformer with photocell, 3-way Splitter, and 25’LVL extension cable. This pond is perfect for your backyard. Install, then use rocks; large or small, gravel, LED lights which are included in the kit, as well as, various plants and flowers to create a beautiful water landscape in your back yard. Pondless Products Large Pondless® Waterfall The lights included additional create the calming nighttime atmosphere. Set up a swing, a comfortable bench, or comfortable chairs and enjoy the peacefulness of the water streaming while you read, or get away from the hustle and bustle of everyday life . You could even set up a barbecue or propane grill and host day time or evening parties around the relaxing view of the water and decorations.